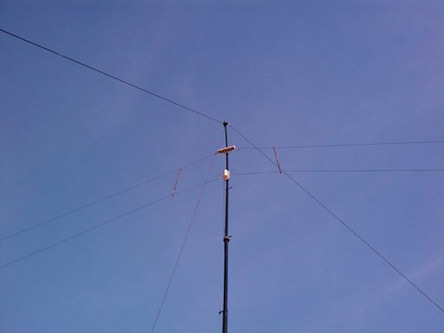 wideband antenna with a resistive load, able to operate in all the HF band. The simulations are oriented to the computation of the standing wave ratio and the radiation patterns of the antenna installed in different configurations. 2. Antenna modeling using 4Nec2. 5. Simulation of the AT-110A antenna (model 1). 5.1. Computation of the standing wave ratio (SWR). 5.2. Simulation of radiation patterns. 6. Simulation of the AT-110A antenna (model 2). 6.1. Computation of the standing wave ratio (SWR). 6.2. Simulation of radiation patterns. 7.1. Standing wave ratio (SWR). the presented by an inverted-vee dipole. 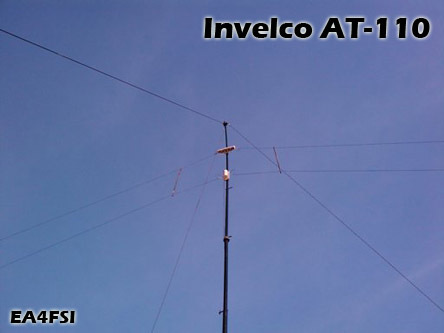 The fig.1 shows an AT-110A antenna mounted in inverted-vee configuration. of the antenna in all the working band. (c) 2008-2019 - Ismael Pellejero Ibáñez - EA4FSI - 28T1 || Contact form || Site map || Page last updated: 01/08/2012.